Back during the days of the Apple IIe, Sierra software published an adventure game called King's Quest. Those were the days of pixilated graphics and 8-bit sound. The game was a top-seller and I remember playing it. Sierra has given developers The Odd Gentlemen the joyful task of adding to the King's Quest story. The Odd Gentlemen have just released the first of five new episodes in the story. All five episodes are narrated by Graham, the aging King of Daventry, as he relives his adventures by telling them to his granddaughter Gwendolyn. In Episode 1, the King tells how he began his quest as a good-hearted but bumbling young man determined to become a Knight. He leaves home to go to the court at Daventry to compete with four other knights for a position at the King’s court. His adventures in besting the other four contestants (they are already knights) is the theme of Episode 1. The knights compete in events that test strength, wit, and speed. It’s a fun story told with wit, and filled with lots of interesting characters, each with a humorous idiosyncrasy. For example, there are three bridge trolls that each carry a bridge on their back. They respond to blasts on a horn and move to place their bridge across a gap so that Graham can move from one locale to another. The graphics are gorgeous and draw you into the story and the animation of Graham is fluid and helps develop his character. I was especially fond of watching Graham try to catch a frog as the animation wonderfully captured the movement of a klutz. It’s an adventure game so the player uses the WASD keys to move Graham around and the space bar to pick up objects. Graham carries objects in a specially designed cape sewn for him by his mother. It will hold objects as big as a giant pumpkin he will need to traverse dark places. As is true in any adventure game, Graham, has to find specific objects to achieve specific results. There is no real violence in the game as the characters interact through slapstick animations that draw laughs. The puzzles are not too difficult and fun to solve as when a bridge troll asks for something big and sweet to eat, you might want to visit the Bakery. There are a few quick-time events where you have to press the W, A, S, or D keys to guide Graham as he careens down a river on a raft to escape a dragon, step across stones, climb walls, and to navigate through other perils. King’s Quest is game that will entertain adults as well as youngster. I think the game works best if the kids play with mom, dad, or a grand parent. The older one can watch the kids navigate around Daventry and be there to help solve a puzzle like getting the Magic Mirror from under a dragon. The game is much like many of the movies made for kids in that there is something in the telling of the story for adults to enjoy too. I purchased the game on Steam for the grand kids Asher, Kate, Emma, John, and Andrew knowing they will find the story exciting, the graphics beautifully drawn, the music excellent, and the problems engaging and relatively easy to solve by simply being persistent. Of all the computer games I've played with the grand kids, Machinarium is my favorite. I reviewed and recommended this game in 2009. Here's the link to the post. 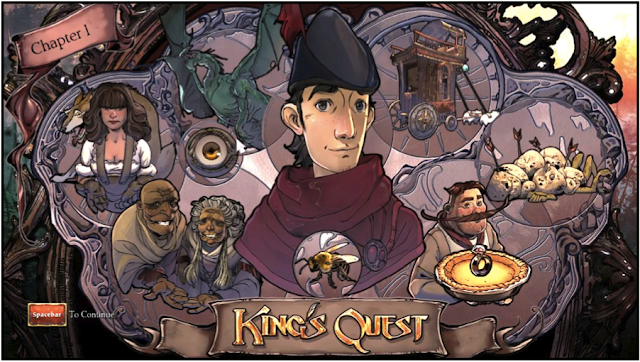 King's Quest Episode 1 has now knocked Machinarium out of first place. I look forward to the release of Episode 2 trusting that the developers will deliver another great game for grandadscience and the grand kids to enjoy.